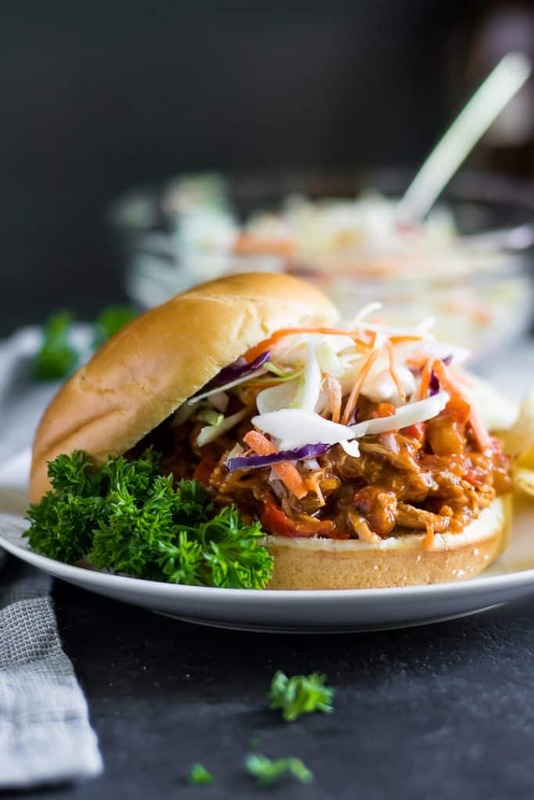 This Simple Slow Cooker Shredded BBQ Chicken is a perfect weeknight dinner especially when eating needs to be in “shifts’ thanks to practice, dance lessons and more. Bonus: leftovers are the best! What do we all want out of weeknight dinners? Simple, no nonsense and delicious. Sounds about right? While I know that Instant Pots are all the rage right now, I will never let my crock pot go–ever. I love that I can put the ingredients in and walk away for the day without thinking. Dinner is ready when I get home and the slow cook taste is like no other. Let me tell you what my husband is not a fan of: Chicken BBQ, ya know, exactly what this recipe is. But he just so happens to like this one right here friends. The reason he dislikes it is because one, it’s what every family picnic seemed to have when we were first dating. Graduation parties, summer baptisms, and other summer gatherings. So it was overdone for him to say the least. But that’s the point of this recipe is that it is so perfect for open houses and any situation where everyone is not necessarily eating at the same time. The other reason? (Sorry family) He thought it was always thin and bland. The problem is, I looooove this stuff. I love shredded BBQ that has been slow cooked in a BBQ sauce. I admit though I like mine a bit thicker but that is what I set out to do in this recipe so that Anthony would be okay with it. And I have to say I was pretty successful. A lot of similar recipes will have you dump your favorite BBQ sauce over chicken and then walk away. At least that is what we always did. I decided to add more. I went for some other spices as well of plenty of garlic. As for the thickness? I found that adding a little corn starch in the end did the trick. It absorbed any runny or watery liquid and made this shredded chicken nice and thick. This helps so that you don’t have a super soggy bun as you eat it as well, right? I love that this recipe is more of a small batch so if you are just feeding one or two you don’t have a ton extra–even though leftovers are ah-maazing. You can easily double, triple and more in case you have lots mouths to feed or want to have it over several nights as well. Either way, you are gonna have some very happy bellies! Place chicken at the bottom of slow cooker. Cover in garlic and season with salt and pepper. Add onion and peppers on top and around chicken. Add BBQ sauce, chili powder, onion powder and paprika and spread sauce to cover chicken. Close and heat on low for 6-8 hours or high for 4-6 hours depending on your crock pot. When chicken is cooked through, using two forks, shred chicken and stir well to allow it to absorb the sauce. Stir in corn starch to thicken about 20-30 minutes before serving. I’ve put my slow cooker away for the summer. I think I’m going to have to take it out again so I can make this! I use mine year round–especially when I don’t want to turn the oven on in the hot summer! 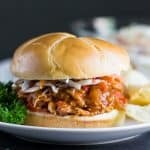 Slow cooker BBQ chicken is so tasty and super easy. We love making it exactly like you mentioned and serving it with a side of slaw. I love that you’ve added red pepper. That’s a flavor we haven’t tried but will be sure to add next time. Sounds wonderful! You get the ease of recipes like this then for sure! 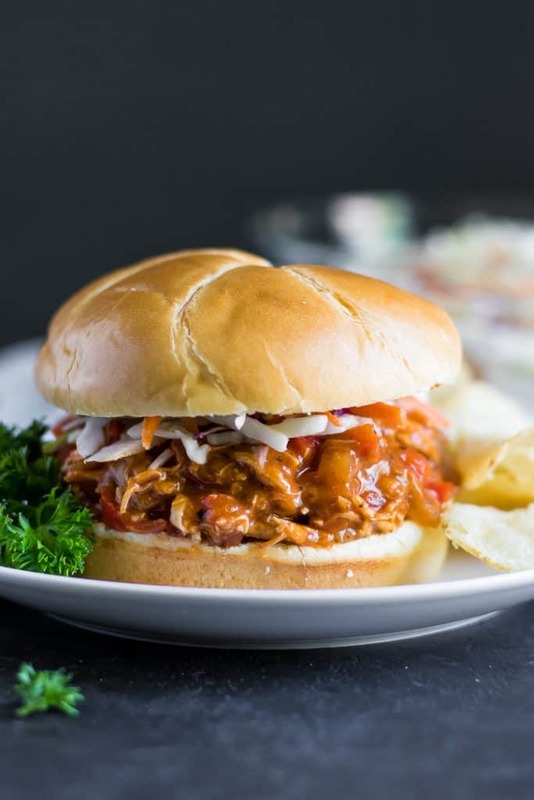 I love my slow cooker too and refuse to give it up precisely because it makes so easy to make delicious recipes like this bbq chicken. I love that is packed with other flavors besides bbq sauce. Yum! Yep, I couldn’t live without it! 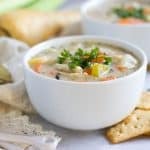 I love super easy slow cooker recipes like this! All I have to do is throw in the ingredients and leave for work and I come home and the dinner is done! Perfect and stress free! Gotta love the slow cooker! Yay! Congrats to whatever your celebration may be! I love shredded pork and the slow cooker is my favorite gadget these days cause I hate cooking in the kitchen. This sounds so yum. Can’t wait to try. Saving this for later. Well, I happen to agree with your Hubby — I prefer shredded pork. BUT!! Your recipe really sounds and LOOKS yummy. A perfect sandwich filling for a get together or potluck. Plenty of yummy filling plus the crunchy coleslaw would make it a real winner. Nice that it’s in the slow cooker – you can keep in warm. I get it—and don’t worry, we do the pork as well sometimes! OMG… mouth drooling! Wayne just walked in and was like can you please make that soon!? Omg looking at your pictures I just don’t think I will be able to get over this recipe anytime soon! Too good. These look great! My husband is sitting right next to me and said he wants these asap lol! Yay! Hope he loves them! I don’t know what I like better, this recipe or these stunning photos! And yes yes yes to coleslaw always being ON the sandwich! We certainly still do both but I love the chicken! This looks so delicious! It’s been so warm here in LA that I am allll about the slow cooker meals. I’ll definitely be testing this one out. Yep. Hi there too so it’s a blessing! 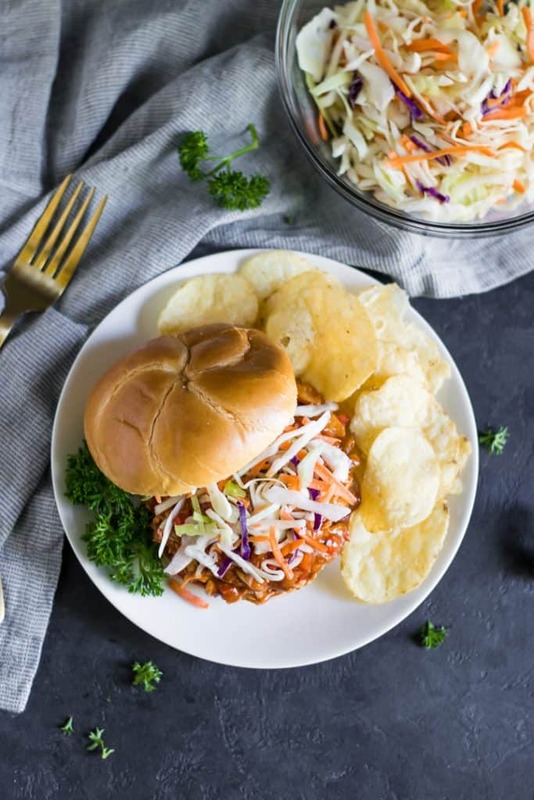 This shredded bbq chicken looks super delicious! 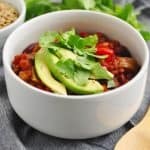 I need more delicious slow cooker recipes like this – thanks! I have to admit, I do have an Instant Pot. I would NEVER let my crockpot go though! This chicken looks so delish. Def on my list to try! I can’t decide on an instant pot. I like be my slow cooker too much! Hi Lorie! I wanted to let you know I’m making this for the 2nd time today 🙂 I loved it so much the first time (just a couple weeks ago), so I had to make it again right away 🙂 Yum! Oh wow, so good to hear!!!! I’ve made it a few times with zero complaints from the hubby. Winning!! Ha! 3rd time today. We have a winner on our hands lol I decided to mix the mixes up a little different for the 3rd time and added cumin, oregano and more paprika, plus a little cinnamon – I’m looking for a chilli flavour! Oooooh, now I am gonna have to try that one!!! !